Kombucha seems to be all the rage these days. Drinking it is the new super cool thing to be doing. We have been drinking and making kombucha for years in our house. Does that make us super cool? Somehow I don’t think so. But we do enjoy drinking it, especially a nice cold, well aged, fizzy batch. Yummmm. Kombucha is an ancient probiotic drink. It is thought to originate in China or Japan. 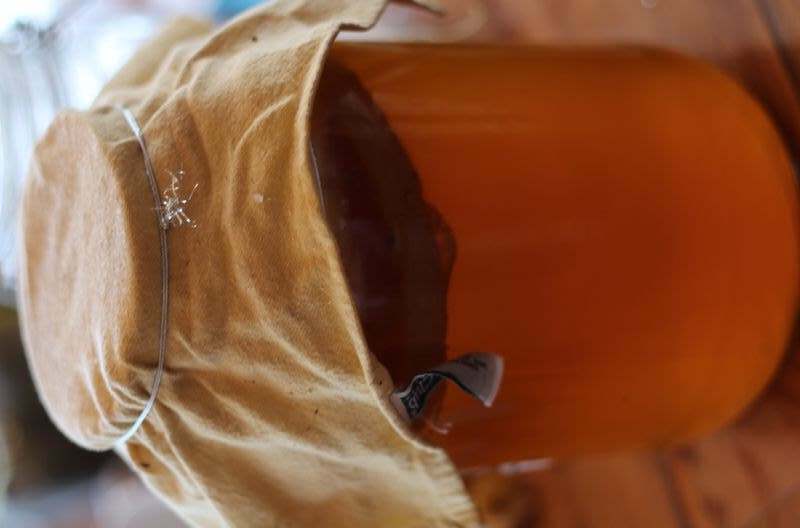 Kombucha is made by fermenting sweet black tea made by using a SCOBY. A SCOBY is short for a Symbiotic Colony of Bacteria and Yeast. 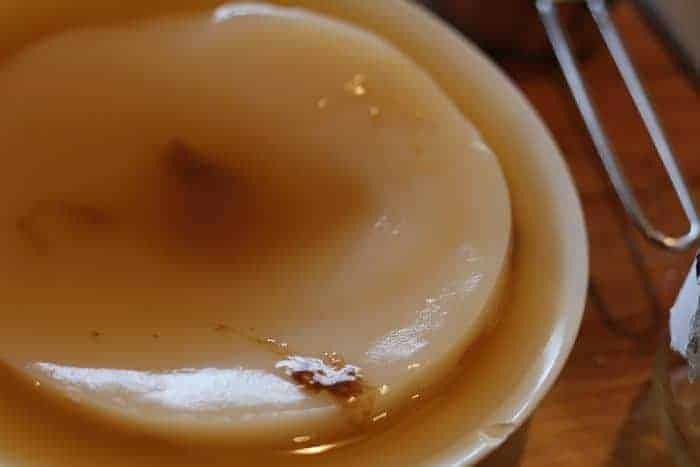 A SCOBY forms a rubbery creamy colored disk on the top of your kombucha brew. A good batch tastes a lot like hard apple cider, without the alcohol. Well, it can have a very small amount of alcohol depending on the brew. It is crisp, a little sweet, a little tart, nice and fizzy and very refreshing. 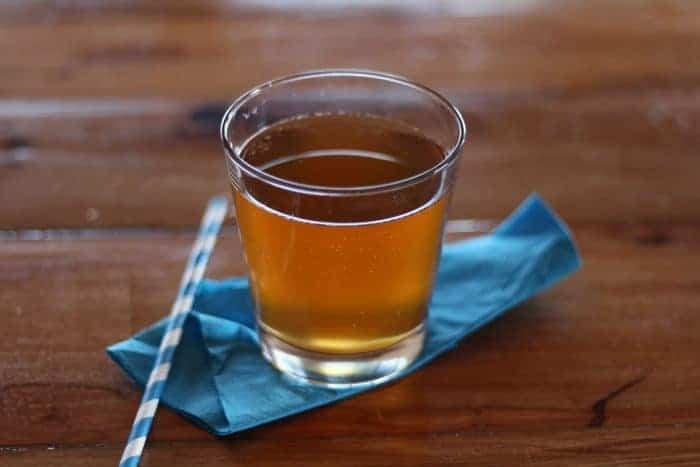 There is currently research into kombucha’s effect on diabetes, heart disease, and liver and kidney health, and its role as probiotic or medically functional food. For more information about the science around kombucha, I really suggest that you read my friend Stacey’s site – kombucharesearch.com. She has some amazing info that is actually research based, not just hearsay and rumor. I am busy. And to be honest, a bit lazy. 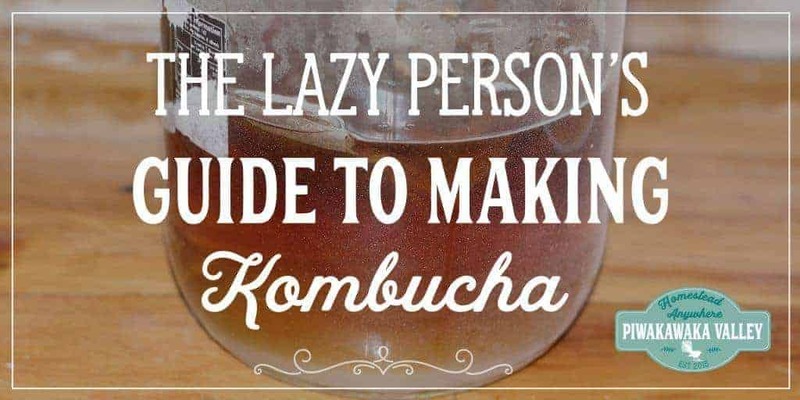 Why fluff around making kombucha when you can just get in, get the job done, and get out? There are so many instructions for making kombucha on the internet, and they make it seem so complex. 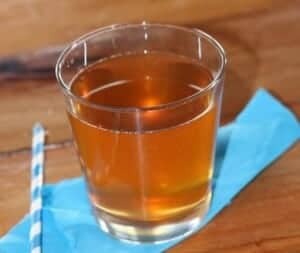 Here it is, the simple, quick, lazy way to make kombucha. You need a large glass jar. A quart/litre is fine to start with, but I have a 3L recycled olive or pickle jar that I got for free from a local steakhouse. Give it a clean and you are ready to go. Step Two: Get a SCOBY and some starter tea. If you know someone that makes kombucha, ask them for a SCOBY and a cup of their already brewed kombucha. If you don’t know anyone, have a look on facebook fermenting groups, or you can buy them on Amazon or Ebay (or if you are in NZ, Trademe). Step Three: Boil the Kettle. That is it really. Not hard. Step Four: Add some tea bags and sugar. For every litre/quart that your jar is, add to it 2 black (normal) tea bags and 1/4 Cup of white sugar. I have a 3 quart jar, so I use 6 tea bags and 3/4C sugar. Be careful, but only half fill it, and give it a good stir with a long spoon. Make yourself a cup of tea while you wait. I told you this was easy. Some SCOBYs will float, others will sink. It doesn’t make any difference. Cover with a tea towel or paper towel and a rubber band or piece of string. You want to keep the flies out, while allowing the kombucha to breath. Place it somewhere warmish, our lives in our kitchen which is always warm, some people use the hot water cupboard. Leave it there for 3-10 days. I suggest you start tasting it from day 3. 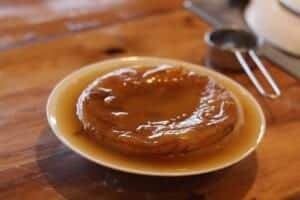 Once it is as tart as you like it, remove the scoby and 1 cup of the liquid into a bowl, and pour the rest into glass bottles that seal well. 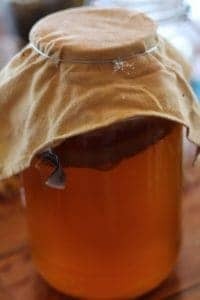 Use the scoby to make a new brew and place the bottles on the bench for at least another week. I like to then move mine to a cooler cupboard to age for a further 2-3 weeks. 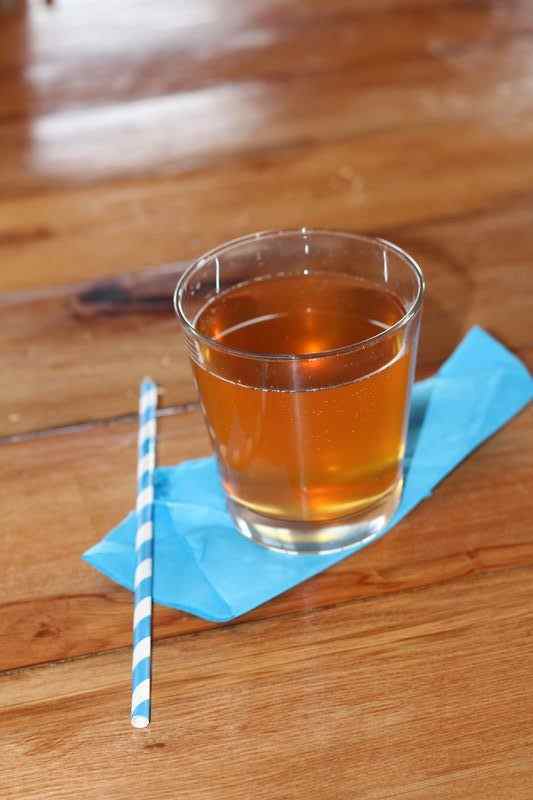 Once the kombucha has aged there should be a bit of fizz and a lovely refreshing drink. We then move them to the fridge and serve it well chilled, poured through a normal stainless steel sieve into a glass. Check it out – my sister over at Pure Simple Living loves it too! Start with 1/2 a glass per day and build up to 1-2 glasses per day. Listen to your body. As with starting any new probiotics you make experience a die off reaction, which will pass but you need to wean on to kombucha slowly. What is the Brown Floaty Stuff? That is the yeast strands, it is meant to be there, but we do strain them out before we drink it. But Why is Mine Not Fizzy? That is OK, it is still fine to drink. Chances are your bottles didn’t seal well enough for the bubbles to build up, or you simply didn’t give them enough time to form in a warm enough place. What are Second Ferment Flavors? You can add things to your bottles before you seal them to add some flavor. Favorites are fresh ginger, berries or grated fruit. Can I use Other Teas or Sugars? The SCOBY needs the tannins in the black tea to grow well. 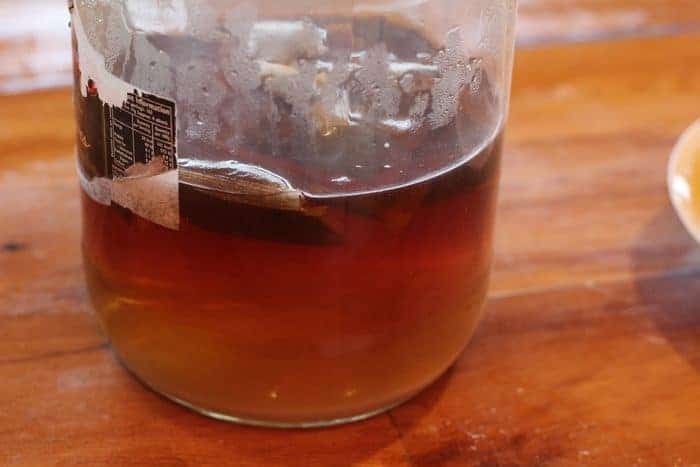 You can switch out half of the black tea bags for green tea ones, or throw in a few fruit flavored bags, but if you do this, make sure you have a spare SCOBY and tea in the fridge incase it goes wrong. Is it OK to Grow Mold? No it should not grow mold, if it has you have to throw it all away and start again. To help prevent mold, make sure you use plenty of starter tea or a Tablespoon of Apple Cider Vinegar to start a batch. It is the acidity that helps keep the mold at bay. What is this Snotty Clear Jelly Thing on the Top of the Kombucha? That is a baby SCOBY forming, it won’t hurt you, but swallowing it may well make you gag…. Do you make kombucha at home? Tell me about it in the comments below! I am on my technical 4th therment… I wanted my mama S to be strong and just kept on… 2nd Scooby-Doo formed and sank…(just saw the auto correct…my 80’s kicked in and am not bothering to correct!) so Scooby-doo 2 is in a hotel in my original batch….and am now going on 2 small 8 oz batches fermenting and new 1q + fermenting….yet I want to increase this one and fill my jug more full….we shall see! I think it’s a great idea to make your own Kombucha, Dana. I’ve bought it a few times and the bottle is about $7.00! Pretty pricy. I’m visiting from Brag About It link party. Yeah it is pretty pricy of you buy it!